FILE - Israeli border police search a Palestinian, next to newly placed concrete blocks in an east Jerusalem neighborhood, Oct. 15, 2015. Israeli police say they have arrested several young members of a Jewish terrorist group suspected of carrying out a July arson attack that killed three Palestinians. Israeli police say they have arrested several young members of a Jewish terrorist group suspected of carrying out a July arson attack that killed three Palestinians, including a young child. A statement released Thursday did not provide the identities or number of people arrested, saying only the youths were part of a "Jewish terror group" believed to have carried out recent attacks on Palestinians. It said the youths were being questioned about the July 31 firebombing of the Palestinian home. The fire killed an 18-month-old boy, his father and mother. 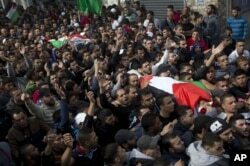 Palestinians, and the international community, had criticized Israel for failing to bring the attackers to justice. The slow progress on the investigation is seen as one factor driving Palestinian anger that has resulted in a wave of violence against Israelis. Since September, 19 Israelis and an American student have been killed in stabbings, shootings and car rammings carried out by Palestinians. Israeli forces have killed 97 Palestinians, mostly attackers, during the same period. Palestinians carry the bodies of Ahmed Abu al-Aish, 28, and Laith Manasrah, 21, during their funeral in the Qalandia refugee camp on the outskirts of the West Bank city of Ramallah, Nov. 16, 2015. In the latest instance of violence, Israel's military says it shot and killed a Palestinian on Thursday after he got out of his car and opened fire at soldiers at a checkpoint north of Jerusalem. A soldier was also wounded in the attack. Also Thursday, the Israeli army said it demolished the home of a Palestinian man accused of organizing a deadly attack on a Jewish couple near an Israeli settlement in October. Israeli officials say the Palestinian, Raeb Ahmed Muhammad Alivi, was part of a Hamas cell that carried out the shooting, which took place in front of the couple's four young children. Israel recently resumed its policy of destroying the homes of Palestinians accused of carrying out attacks. The practice has been condemned as inhumane and ineffective by various international human rights groups. Palestinians say the wave of violence is rooted in frustration over nearly a half-century of occupation and they accuse Israel of using excessive force to suppress the unrest. Israel says the current violence is due to a Palestinian campaign of lies and incitement surrounding a sensitive Jerusalem holy site, which is revered by Muslims and Jews.